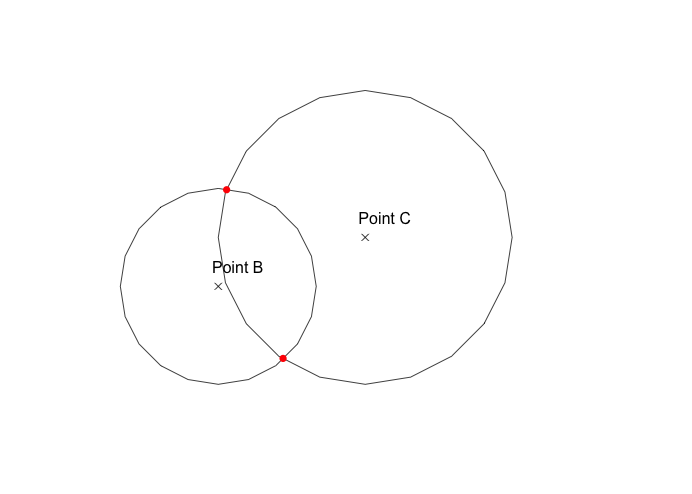 I'm trying to develop a function in R that will locate a point (A) on a map given distances between that point A and two other points (B and C), for which exact coordinates are known. The problem I'm coming up against is that my approach is sensitive to the shape of the triangle, and thus the number of conditions in my algorithm is higher than I think it needs to be, probably because my middle-school maths aren't good enough, so I'm looking for somebody to be really condescending, tell me how silly I'm being, and help me to a general approach to this problem. For the record, I'm aware that there are two possible points in space that satisfy these assumptions. I'm happy to have both. Lastly, I'll point out that while this sounds like homework, it's actually ecological research, albeit performed by somebody apparently underqualified to be doing it. KevinMayall's suggestion of intersecting circles is the easiest. A good theoretical treatment can be found at Wolfram Mathworld, which may get into more detail than you want to get this working (but is nice background for writing a paper about your methodology). This StackOverflow answer has a broken link but outlines a basic approach. If d < | r0 - r1| then there are no solutions because one circle is contained within the other. One important note, however, is that the mathematics here is based on Euclidean distances. The effect of curvature of the earth is not included. This is OK for small distances (< 20km, see this GIS FAQ, scroll to Q5.1) but if you're working on large analysis it begins to be inaccurate. The gIntersection function from the rgeos library might help you. See the commented code below. Not the answer you're looking for? Browse other questions tagged r geometry mapping triangulation-survey or ask your own question. Using pysal to map location of coordinates? How to get point location?